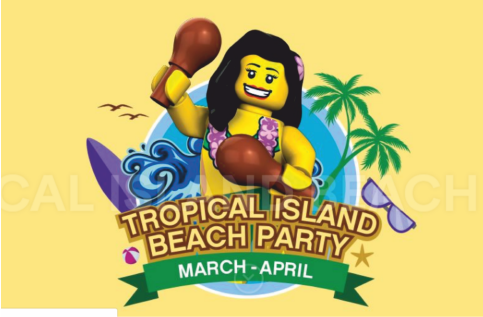 Tropical Island Beach Party at Legoland Waterpark - The Source Online M.E. Its time to get down and party at the Legoland Water park Tropical Island Beach Party (TIBP). A highlight on the park’s event calendar – the TIBP takes all the fun that any Legoland Waterpark visit already has, and ramps it up with great music and a great line up of activities that the whole family can enjoy. An African drumming group got the crowd going at intervals throughout the day with drumming and dancing activities. For those of you who like a nice place to kick back and relax with a bit of privacy, there are cabanas available for rent from the kiosk near the main entrance area. Ideally situated right in front of the main pool and close to all F&B outlets in the park, they offer the place to relax in between all the fun. Cabanas include privacy curtains, a portable air conditioner, lockable safe, sun loungers and sofa sets. Designed for families with kids under 12, the park boasts facilities for all ages. A shaded toddler pool offers tiny tots the chance to get involved, the joker soaker is a series of intermediate slides and water based climbing areas and games, and finally the higher more thrilling rides for parents and older children to enjoy. A variety of food options are available and refillable bottles can be purchased for AED 40-00 which allows the barer to refill and drink as many times as they want during the day which is a great option for thirsty kids and adults alike. The day ended with Virgin Radio DJ Kris Fade inviting family teams to get involved in games and challenges like the raft building race and giant castle building competition. Great prizes were on offer for winning teams that included lego packs and Virgin radio goodie bags. As the sun began to set, the park closed with a spectacular fire show to give guests that last bit of excitement before home time. The park is full wheelchair accessible with well thought out toilets (including showers) for disabled guests. A wonderful fun venue for families with young children. Lockers (extra charge) and showers are available on site. Towels are available to rent or you can bring your own. No outside food or drink is permitted in the park. ID is required when purchasing tickets.